Fiction – hardcover; Viking; 256 pages; 2009. 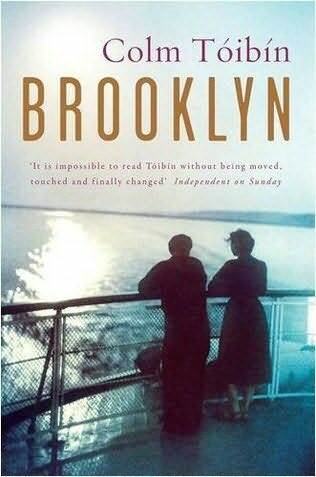 As long time readers of this blog will know, I have a soft spot for Irish fiction, so it was no great surprise that Colm Tóibín‘s Brooklyn would be my type of book. But what I did find surprising was just how much I liked it. I devoured it in just two sittings this past weekend. The book opens in poor, provincial 1950s Ireland — Enniscorthy, County Wexford to be precise. Eilis Lacey, a part-time shop girl, leaves behind her mother and devoted older sister, Rose, to immigrate to Brooklyn, USA, in search of a better life. She lives in an all-girl boarding house, presided over by the matron-like Mrs Kehoe, and spends her days working in a local department store and her evenings studying for a book-keeping qualification at Brooklyn College. Along the way she makes several friends, meets a boy and finds herself living a relatively contented life, despite the fact that she still misses her family back home. I’m not sure I can really say anything else without giving away crucial plot spoilers, so I shall keep schutm, suffice to say this is a quietly devastating read, one in which it is completely possible to lose all track of time as you get lost in the world presented here. Brooklyn is a gentle read, but its gentleness should not be mistaken for shallowness. It might be set in the 1950s but it touches on universal themes that resonate today, and I’ve yet to read anything that so perfectly captures the profound sense of dislocation you feel when you swap one country for another and then return to your homeland for the first time. In short, Brooklyn is a superb paean to homesickness and the émigré experience. I think I identified with it so strongly because it shows, in an understated but powerful manner, how all emigrants have to make that god-awful decision about whether to stay or go, a decision that paralysed me for years. When Eilis is confronted with this choice she is tormented because there is no single right answer: whatever she chooses will have both negative and positive repercussions for herself and her loved ones. And while I’ve tried to avoid reading reviews of this book, fearful that it will put me off reading it, I’m conscious Brooklyn has drawn criticism from some quarters over Eilis’s passive nature, yet I did not see her that way at all. Sure, her move to Brooklyn is organised by others, namely Father Flood and Rose, but she recognises this as an opportunity for which she should be grateful, even if she finds the prospect of leaving all she knows behind a daunting one. She’s proactive enough to get herself educated while in Brooklyn, because she recognises this as another opportunity to better herself in ways which would not be possible “back home”. The truly lovely thing about Eilis is that she is a good person, and she thereby attracts good people and many acts of kindness come her way, but her good manners and her unwillingness to rock the boat should not be mistaken for passivity. You totally capture the sense and feel of this book. I loved it as well when I read it. I was so excited when I turned the last page that I went off to read all the wonderful things others had to say about it and was totally put off to see negative remarks. I read somewhere that Eilis became an immigrant twice over–not only when she moved to Brooklyn, but when she returned home as she wasn’t the same girl as when she left. I thought it was extremely eloquently done and I would be quite happy to see it on that shortlist! I totally agree with your assessment. This is one of those books that is easy to read but its simplicity is deceptive. I have described Eilis as passive, but I didn’t see that as a flaw. When a choice had to be made, she made it, and when something had to be done she did it, but she wasn’t inclined to rock the boat. These days we’re conditioned to see boat-rockers as superior people, but there’s something to be said for letting events unfold as Eilis does. That’s a lovely review; I’ve read many good reviews of this and hope that there will be a copy available at the library soon! I loved it too, and I found it especially compelling because it captures the quiet *heroism* of the young female emigrant. This book was on my shortlist and I think the focus in your review on the emigre experience is dead on. My guess is that the jury missed that point — novels set even partially in America (see Netherland from last year) don’t seem to do well with Booker juries unless they take a run at it (see Vernon God Little). It has been some months since I read this book but I have every intention of going back to it. I had a personal reaction to this novel (it’s not across the Atlantic but having recently moved away from my home city, I identified) and I agree that it is powerfully evocative of the emigre experience. Beautifully written, gentle, and subtle, Brooklyn is one of my favourites from the Booker longlist. I had read it before the announcement and because of its implied “simplicity”, I almost forgot about it; your review reminded me what I loved about it so much. Danielle, I went through a long phase where I came to realise I would never truly belong in London but I would never truly belong in Australia either — that sense of dislocation was distressing. I’ve come to terms with it now, but at the time it was traumatic. I thought Toibin captured this feeling perfectly in this book; I had never read anything describing this before, so I think that’s why I loved it so much. It was absolutely pitch perfect. Sadly, the book didn’t make the shortlist, but I think that’s largely because it’s probably too simple — it doesn’t really push the boundaries of literature in any way. Thanks, Teresa. I agree that we’re conditioned to see boat-rockers as superior, when, in fact, sometimes it can be harder to let things slide. I think the difference is knowing when to rock the boat and when to let things slide, and Eilis, in my opinion, tread that line perfectly. Cheers, Verity. I’d be surprised if there wasn’t a long queue at the library for this one, but the wait will be worth it. Lisa, your review makes me want to read Henry James now, or do you think I can read Toibin’s The Master without having read any of James’ work? When you go back “home”, Claire, it will be interesting to see how you feel. I thought I’d be used to the sense of dislocation having moved from the country to the city in my late teens, then from Melbourne to Brisbane in my mid-20s (now *that’s* a culture shock), but that was nothing until moving from one hemisphere to another! Fantastic post on this book, and you are right its a hard one to review without giving everything away. This was my personal favourite for the Man Booker this year though sadly it didn’t make the shortlist which I personally think is criminal… but thats another rant for another time. Loved this book and think will be having a Toibin binge very soon. I bought his first novel, The South, the other day, so I’m really looking forward to reading it. I too loved this book and I would have to agree with Lisa Hill on reading his previous wok – The Master. I have read a couple of James’ novels but I don’t think it would be a prerequisite. I want to go back even further and read his Blackwater Lightship now. Back to Brooklyn – I think it extremely subtle and moving. It may be hard to understand someone somewhat falling prey to their fate (especially in our wild and selfish times!) but there is honour in such ways as well. Oooh, do read Blackwater Lightship — it’s wonderful. But it’s even sadder than Brooklyn!